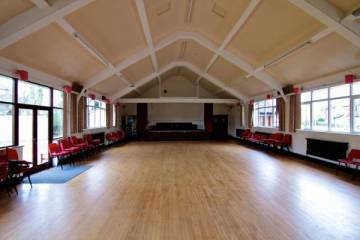 There are two large halls with their own kitchens and toilets with access to the rear garden. 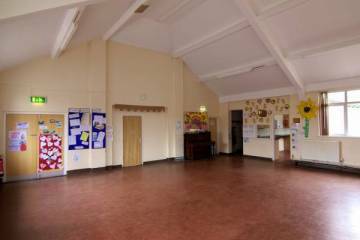 There is a third meeting room with access to the main hall kitchen and toilets. Each kitchen has two sinks and cooking facilities with with cups saucers and plates, tea/coffee making electric urns, kettles, large teapots and jugs. 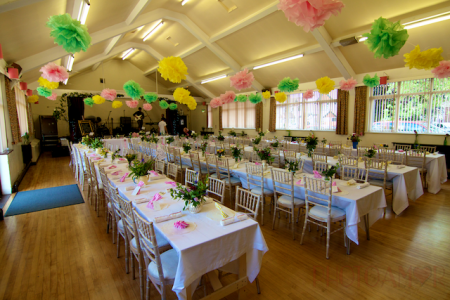 There are 22 large fold away tables, 12 half size fold away tables, 15 card tables and 200 chairs. There is Wi-Fi in the hall and two USB charging points in each kitchen. Please ask for the current Wi-Fi password at the time of your booking. There is a hearing aid Induction Loop in the Main Hall and Douglas Taylor room. A plan of the hall is shown below. This is intended to show the relative locations of the three rooms available for hire and their sizes. Scale is approximate.